Tennant Creek Police, Fire and Emergency Services celebrated Australia Day in style, joining the community for a day of festivities at Lake Mary Ann. Hundreds of locals turned out for the afternoon of novelty Aussie races, including thong throwing, egg catching, leaky bucket race, cold pie eating contest, tug of war and the raft race. The Fire and Rescue Service showed their skill, taking out the leaky bucket challenge and the women's team from Police walked away with the win in the tug-o-war. NTES volunteers showed off their boat to willing members of the public whilst the Fire and Rescue team kept the temperature down with their slip and slide creation. "We're a small community here in Tennant Creek. The Australia Day festivities give us the chance to get in and show that we are a part of that community whilst showcasing our people and promoting our resources and capabilities" said Senior Station Officer Nathan Ferguson from Tennant Creek Fire and Rescue Service. 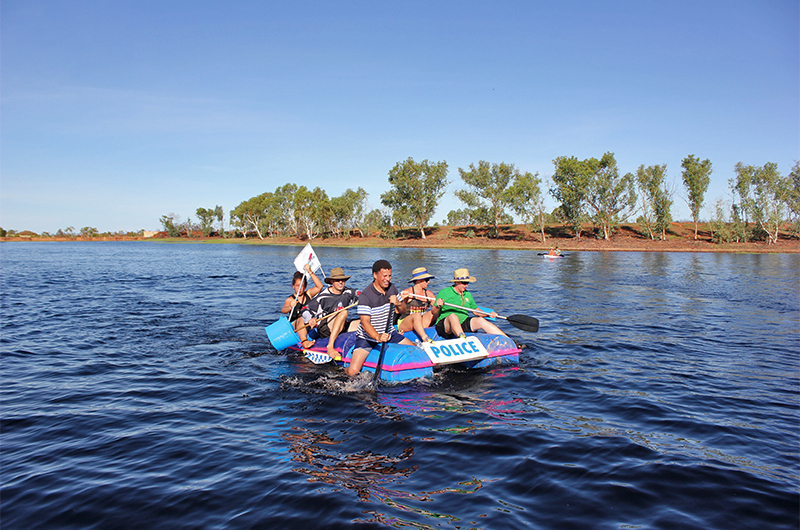 NT Police participate in the raft race on Australia Day.